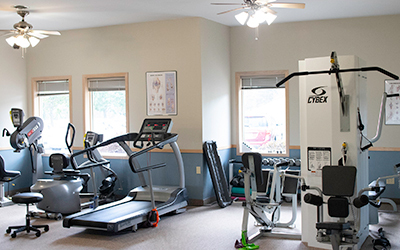 The experienced physical therapists at Owens Physical Therapy know firsthand the hardships that afflict individuals of all ages suffering from chronic pain, injuries or reduced mobility. Our dedicated team proudly offers a wide range of treatments designed to reduce and eliminate pain and soreness and help you return to your normal routine. In addition to providing a high level of quality, professional therapy, we guarantee that you will always be treated by an experienced and licensed therapist — and never an assistant. When you struggle with painful back and neck pain, even the simplest of tasks such as sleeping, standing and walking often become nearly impossible. The back and neck experts at Owens Physical Therapy Specialists know firsthand that successfully treating back and neck pain involves locating the source of your pain, helping you to reduce or eliminate it — and teaching you how to manage and prevent it in the future. Learn more about Grand Rapids back and neck injuries here. Based on the internationally-renowned McKenzie Method of Mechanical Diagnosis and Therapy (MDT), McKenzie Spine Therapy incorporates a proven method of assessment and treatment for spinal and extremity pain developed by New Zealand Physiotherapist Robin McKenzie. In practice around the world for over 30 years, The McKenzie Method allows the physical therapists at Owens Physical Therapy Specialists to properly assess and diagnose all areas of the musculoskeletal system — including the spine, the neck, joints and muscles. Learn more about Grand Rapids McKenzie spine therapy here. Whether you play youth sports, consider yourself a weekend warrior or compete at a high level — athletic injuries serve as painful, frustrating and common reminders that we all have our limits. At Owens Physical Therapy Specialists, our experienced sports injury team focuses on one goal: getting you back to the field, court, pitch, pavement, sand or ice as quickly and safely as possible. Learn more about Grand Rapids athletic injuries here. As we age, our joints, muscles and nerves go through numerous changes that often result in increased soreness and pain, loss of functionality and lack of mobility. Many of these changes cause debilitating pain that can disrupt your life and keep you from accomplishing ever the most basic tasks and activities. If you are age 50 or older, our senior therapies focus on helping you reduce pain and get back to your normal daily activities. Learn more about Grand Rapids senior injuries here. Nothing hurts a parent more than seeing their child in pain. If your toddler, preschooler, middle schooler or teen suffers from pain due to an injury or accident, we can help them get back to participating in the activities they love! Our personalized approach makes sure that your child or teen receives the care they deserve in order to return to sports, playing with friends and taking part in normal daily activities. Learn more about Grand Rapids pediatric therapy here. After enduring foot, leg, hip or knee issues, many patients truly appreciate how custom orthotics help them to walk, run and move freely without being in constant pain. Using the innovative Footmaxx system, the experienced orthotics experts at Owens Physical Therapy Specialists custom fit orthotics designed to improve a wide variety of issues. Our state-of-the-art computerized system assess the mechanics of your foot while walking to find the imbalance that needs correcting. Learn more about Grand Rapids custom orthotics here. Our physical therapists often incorporate dry needling into your rehabilitation plan to help you reduce pain and improve functionality of your problem area. Dry needling uses a thin needle to penetrate your skin to bias underlying muscle spindles, myofascial trigger points and connective tissue. Dry needling used for physical therapy stems from Western research and the study of the nervous and musculoskeletal systems. Learn more about Grand Rapids dry needling here. Ever wonder about your running form — and how it may be contributing to your aches and pains? Do you struggle to find the right running shoes that fit correctly and improve performance? If you answered yes to either of these questions — then video gait analysis might be right for you. Improved video technology allows our physical therapists to accurately analyze and assess your running form from a visual and biomechanical perspective. 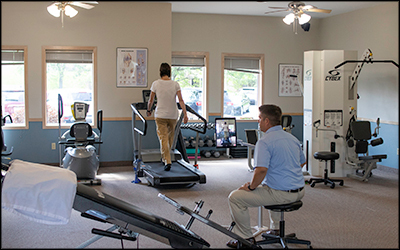 Learn more about Grand Rapids video gait analysis here. Have you ever experienced a feeling of dizziness or the sensation that the world is spinning? If you answered yes, you possibly went through vertigo — also called benign paroxysmal positional vertigo (BPPV). Owens Physical Therapy’s trained vertigo treatment specialists reduce these symptoms using several proven drug-free methods. Most of our patients complain about dizziness with a change in position like rolling over in bed, bending over, washing their hair in the shower or movements that involve turning or moving their head. Learn more about Grand Rapids vertigo treatments here. NEED TEXT. Learn more about Grand Rapids maternity Therapy here. For more information about Grand Rapids physical therapy services from the xxperts at Owens Physical Therapy Specialists, please contact us here or call us directly at 616.956.0400. Copyright © 2019 Owens Physical Therapy. All Rights Reserved.